Valedictorian speech topics template including sample phrases for the most outstanding graduate who is invited to deliver the farewell address at the ceremony in college style or at the university and school.My advice is this: the student with the highest rank to catch the memories and feelings of the whole class in the structure of your talk, in each and every of your points. Now lets see how you could prepare a departing text. Ask your fellow students what they like about the last years. List all the things they suggest. Try to use the most valuable suggestions and hints. Happy memories you share together. The things they discovered in life. Of course they will help you when you ask for sample valedictorian topics. This method and the speech topics in the Top Ten below will help you to collect the right ingredients and themes. I have outlined this top 10 of valedictorian speech topics like a checklist. Consider them seriously, make notes and in the end you have a blueprint for your speech. List your content in a way that is appropriate for you and of course to the occasion and the attendees at school, college or university. 1. Choose an introductory line. For example: To the class of 2006. Your fellow students are your main speaking targets. 2. Start with a quote, a short anecdote, a thought, an incident or a short poem that hooks the public. It will keep their attention during the whole performance if you loop back to it at the end. Thank and gratitude who have helped you along the way. 3. For instance thank your parents and other family members. What did they do for you? What have you learned from them? Mention each person plus his or her specialties in one sentence. 4. Thank your friends. Thank them for friendship, support, the believe in you and for general wisdom. 6. Reflect on the past years and draw out some of the events. Tell what you have learned of it. Mention special school events, popular activities, interesting classroom experiences, the academic successes, personal accomplishments, failures, a beloved teacher. Mix in some humoristic anedoctes. Praise all classmates for their accomplishments and comradery. 7. Tell about your expectations for the future. Where has life at this school,college or university led you personal? What are you going to do now in life and why? Are you inspired by a teacher? 8. Transite all experiences and lessons to the future. Offer examples of things you have learned that are always valuable in life. Wish all graduates all the best. What do you want the graduates to remember of tonight? 9. End your speech with memorable remarks. Offer a ceremonial message for the future. 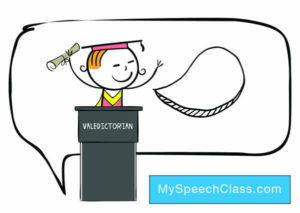 Repeat the introduction and relate the major points of the body of your graduation speech to your sparkling opening. 10. Consider this moment in time. Reflect on important local, national or international events, reflect on your place in history. Thank the audience for their attention. Remember: These are general farewell speech ideas, give each of them a personal touch. Great chance they will remember you in time. 1. Show your sample valedictorian speech to a few classmates. Listen to their comments. Change your concept in the way they like it, because you are not only talking to them, but also about them! 2. Be sharp and short: take no more than five to six minutes for delivering. Valedictorian speech topics and checks on storytelling intros, special events, friends and fellow students, the don’ts , thank you’s and the end part for final departing – without using speaking management software but you can apply them to a graduation address too. INTRODUCTION – Does your opening statement grabs the attention? Short poem that reflects on the feelings of the whole class. Stories about the students in the graduating class. Storytelling about the principal, the dean or board members. SPECIAL EVENTS – Did you reflect in your valedictory on milestones and incidents? Stories about the principal, the dean or board members. Major events in the world. Memorable events in your community. Important storytelling events at your school in the last years. Meaningful activities your schoolmates did together. What you have learned some of the events. Consider this moment in time. Reflect on your place in history. Thank them for general wisdom. Thank them for happy moments you share together. Ask them what they like about school, college or university. Values that are important to the students and the audience. Gently poke fun but do not to offend. THE THANK YOU’S – Express gratitude to all who helped you along the way. Thank your parents and other family members. Thank the principal, the dean and mentors. What did they do for you? What have you learned from them? Where has life at school, college or university led you? What are you going to do now in life and why? Wish all graduates all the best. What do you want them to remember of tonight? Offer a message for the future. End with a few inspiring phrases or a farewell statement. Double-the information included in your public speaking scheme plan. Did you outline your presentation? Lenght: five to six minutes is enough for a valedictorian speech. Cite this article as: Jim Peterson, "Valedictorian Speech [Arrangement, Topics, Checklist]," in My Speech Class, May 13, 2018, http://www.myspeechclass.com/valedictorian-speech.html. Have a great speech topic? Tell us!